I came across a program that claims it has a system that can help people make $25,921.75 in 30 days. Among the other programs I have reviewed this year, this is one of the most daring claims I’ve seen. If you’re one of the people who has visited their site, then you may have seen their claim, and I’m sure it caught your attention. That’s probably why you’re here reading my CB Wealth review because you want to know if this program is the real deal. So, is CB Wealth a scam or something you can rely on to help you create a decent income online? You’ll soon find out after reading this review since I will provide you with all the info I got about this program. Hopefully, it will help you make the right decision because there are things you NEED to know before joining this program! CB Wealth is a program that claims it has a system that can help you make $25,921.75 in 30 days using their done-for-you system. 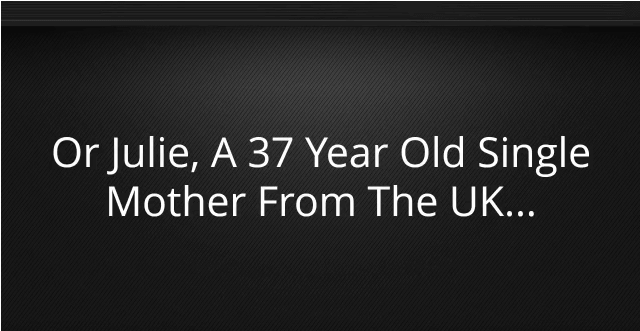 Based on their sales video, the alleged creator of this program is James Robertson, and according to him he is a writer, researcher, and online business owner, but that’s all the details you can get from their site about who is behind this system. In my opinion, there are NO shortcuts or secret systems that can help you earn a lot of money online without putting in the effort. Honestly, I don’t recommend this program because it contains some big red flags, that, in my opinion, makes it a risky investment. I would suggest that you look for other legit opportunities that can truly help you create a full-time income online. What is CB Wealth and what does it offer? 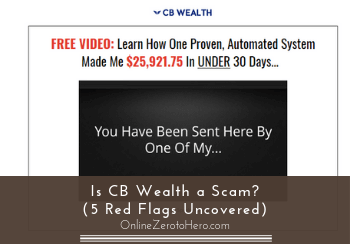 The most significant claim on CB Wealth’s landing page is the statement that you can earn $25,921.75 in 30 days using their done-for-you system. Some of the income claims on their sales video. Based on their sales video, the alleged creator of this program is James Robertson, and according to him he is a writer, researcher, and online business owner, but that’s all the details you can get from their site. Also, he will tell you that his system is unlike any other you’ve seen on the internet because it can help anyone earn a life-changing income, which also means that you’ll be making a ton of money if you leverage his system. That’s why when I saw the claim that this program will heavily rely on an automated or done-for-you system, I became a bit skeptical. For me, this is a typical type of business model I’ve seen before in other programs that I have reviewed in the past. Using a done-for-you system is very appealing to some people who want to earn an income online in the least possible time without any effort involved, but it’s RARELY the best method – especially if you want to create a sustainable income online. The first time I visited CB Wealth’s landing page, I could right away point out some red flags on their site because it’s NOT that hard to find. Honestly, their site uses the same layout and claims that you can find in other similar programs, and I have reviewed a lot of them in the past. This is the reason why I wrote this review, so I can share with you several red flags that I’ve uncovered from their sales page. These are things you definitely need to consider before investing any money. At least you then have a better idea about what you are getting into and what potentials and risks there might be involved. So here are some of the red flags you need to know. The first time I watched the sales video of CB Wealth, it was obvious to me that James wants to highlight several income claims, but he’s NOT interested in explaining how his system works. He also makes it sound like technical skills and experience is not a requirement in their program. So, even if you’re a complete beginner, you can succeed if you use their system. It’s also clear that they will be using affiliate marketing as the main business model of this program, which is a legit method in making money online. If you don’t have any idea what affiliate marketing is, it is actually a way of making money online by promoting other people’s products and services. You usually use your own website or a social media platform to promote their products, and this will be through an affiliate link that was supplied to you by your affiliate company. Once the people you redirected to their site via your affiliate link bought their products, you’ll be paid back through commissions. Affiliate marketing is a great business model, and it’s also the ideal way of making money online, in my opinion, but it should be done ethically. However, the issue I have with CB Wealth is the lack of explanation of how their system works and your role within their system and how you will be able to use it to make money. In my own experience as an affiliate marketer, when a creator of a program is hesitant to give you details about their program, then you can expect that they are NOT transparent for a reason. Just think about it – would you buy a product or service without getting information about how it works? You must at least get some idea of how a product works, so you’ll know if it can offer some value to you or you’ll just waste your money. I hope you take this red flag seriously before you decide to join this program. Another red flag that I would like to point out on their sales video are the success stories that James mentions to be genuine, but it’s all texts without photos of their so-called successful clients. James only shows the names of their so-called customers, but no photos are presented. They don’t show any photos, and they don’t even reveal the last names of the clients. Most importantly, they don’t mention how these so-called clients acquired these huge amounts of money. In my opinion, anyone can create a video and invent stories, but in reality, it might just be stories, and there’s no way for you to verify if they are real testimonials. It’s important to verify the testimonials in any program because you need to know if what they are using are real income proofs. If they can really deliver on their promise, then they should have genuine testimonials from their real clients on their sales page. But this does not seem to be the case with this program, because they are NOT transparent enough to show the photos of their clients. That’s why this is another red flat that you should consider before you make your final decision. The initial cost of this program is $37, but it’s just the initial fee to get into their membership page. Once you have joined and paid the initial fee, you’ll soon see that there are several upsells waiting for you there. 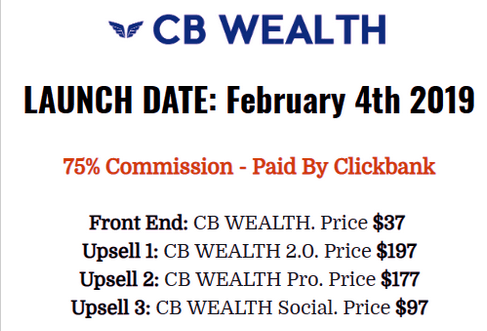 Based on my research, I found out that CB Wealth is marketed in a way that you’ll get the impression that you only need to spend $37, but it’s only the beginning of their sales funnel. In fact, there are 3 upsells waiting for you after your initial purchase and this could reach up to $508, which, in my opinion, is no longer affordable especially for those who are just starting out in affiliate marketing. Although I’m not questioning if these upsells are good or not, as I have not bought any of them so I cannot say for sure if these upsells can really deliver the results. However, the issue I have with these upsells is that it was never revealed on their sales page and video, which, in my opinion, is a bit upsetting because they have an obligation to show it to all their prospects. It’s essential for you as a consumer to know the real cost of their program, before you decide to purchase it. So, you can expect to spend more than $37 before you can realize the full potential of their product.